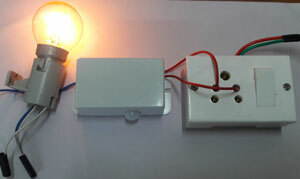 A Simple design of PIR Light using Tranformerless Power Supply and Triac for driving the load. Too compact and can be enclosed in a small case. The light turns on when the PIR sensor detects human movement and turns off after the preset time. Re triggers in another movement. Its range is 30 cm to 10 meters and time delay, 30 seconds to 3 minutes both can be adjusted using the presets in the PIR sensor Module.